i mentioned a while back that i am creating my own 1978 topps burger king/update kind of set, featuring all of the players who appeared in a game for the 1977 and/or 1978 dodgers who did not appear (as a dodger) on a 1978 topps card. one such player is bill north. i used a photo from steve's baseball photography pages, and i think it turned out great - especially given the fact that you can see dodger stadium's right field pavilion and scoreboard in the background. i also created a back, which was pretty easy since north was already in the 1978 set. just a couple of text changes and i was done. 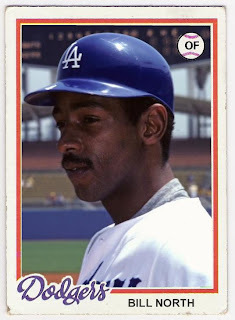 the dodgers acquired north in may of 1978 for glenn burke. he underperformed in la, and left as a free agent, heading back to the bay area (this time with the giants) for the 1979 season. 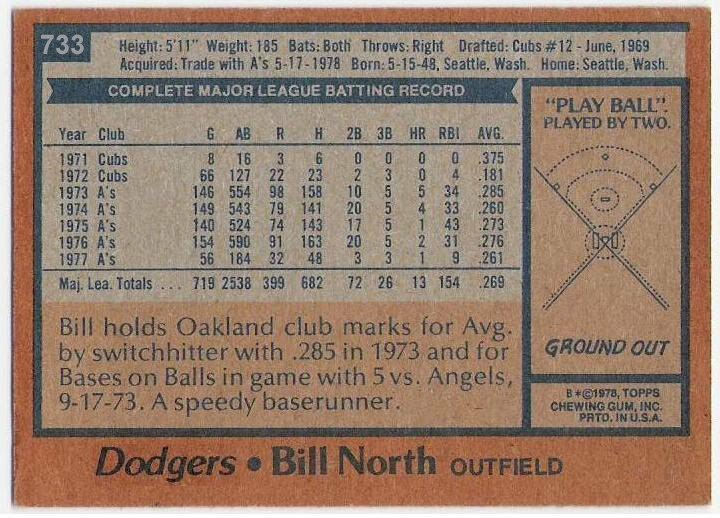 as a dodger, he scored 54 runs in 110 games, stole 27 bases, and managed to get on base at a .371 clip, but his slugging percentage was an anemic .266. of his 71 hits, only 10 were for extra bases and those were all doubles. he went 0 for 8 in the 1978 nlcs against the phillies, and 1 for 8 that same year in the world series against the yankees. not surprising, i guess, as in 59 career post season at bats, north had just 3 hits. still, he was the dodgers' primary center fielder during his brief stay, and for that i salute him. i'm keeping a running checklist of the cards i have created for this set over on the right sidebar. check 'em out and let me know what you think! 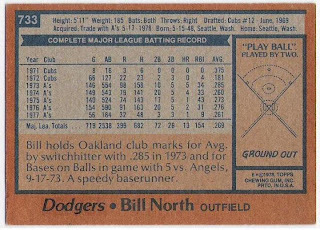 here's to you 1978 topps bill north - the card that should have been! I am always a sucker for cards that should have been. Great job.